Cold but calm. That was the order of the day for Sunday morning. If the temperature had been warmer it would have been ideal sailing conditions. It was great to see so many members braving the cold and sailing. 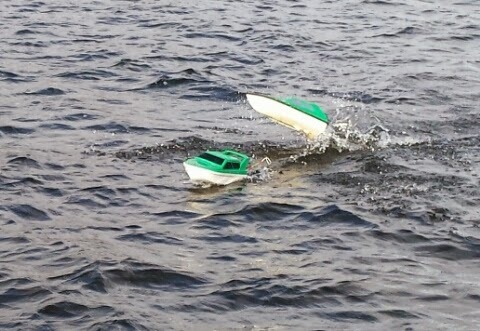 The fast boys had a few good clean races, although Carl had to retire his F1 due a drive problem with the outboard. Because of the total lack of wind first thing, I decided not to take my yachts, big mistake. By mid morning there was a lovely breeze of which Terry and Paul made the best use of. John took along his goose, now with modded rudders and racing neck. There were several members with Club 500s had held improvised races. Lets hope for warmer sailing weather soon. Mark Hough. A a polite reminder to those club members who have not yet paid both their club memberships and insurance. They are now overdue, so please forward to the Membership Secretary Steve Gregory ASAP please. Heres a report from our Club Chairman, Mark Hough. Worlds largest container ship reaches the UK. CSCL Globe: Felixstowe arrival for world's largest container shipThe CSCL Globe arrived into Felixstowe after leaving China about a month ago Continue reading the main story Related StoriesPort announces expansion plans Dredging begins for port expansionNew £59m rail link opens to freight The world's largest container ship has arrived in the UK for the first time. The Hong Kong-registered CSCL Globe, measuring more than 400m (1,313ft) in length, docked at Felixstowe loaded with about 19,000 standard containers.